In just the past few weeks, Foursquare released it's Foursquare for Business app (if you don't know what Foursquare is, read Jeff's post from 2010). The app allows business owners to share information with their customers and view analytics right from their smartphone. This new app seems to be a nice and quick way to connect with your customers across multiple platforms. From the app, the business owner/manager can create a Foursquare update and also cross-post it to Facebook and Twitter. Another useful feature of the Foursquare for Business app is the ability to view check-ins. In the past, you could only view check-ins from the past 3 hours, but now you can see check-ins from the entire day. You can also easily view who your top customers are. Also, the app will allow the manager to drive traffic to their store by posting Foursquare specials. For example, a coffee shop manager could quickly post a picture of a latte with a caption "the next ten customers who check-in on Foursquare will get a free latte with the purchase of a muffin." As an ag business owner, have you used Foursquare? If yes, how have customers responded to your Foursquare presence? 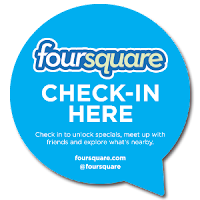 Do you think this new app will allow you to manage your Foursquare presence more effectively?